Lunchbox Dad: Pulled Pork Tacos Are Simple with Lucky Supermarket! 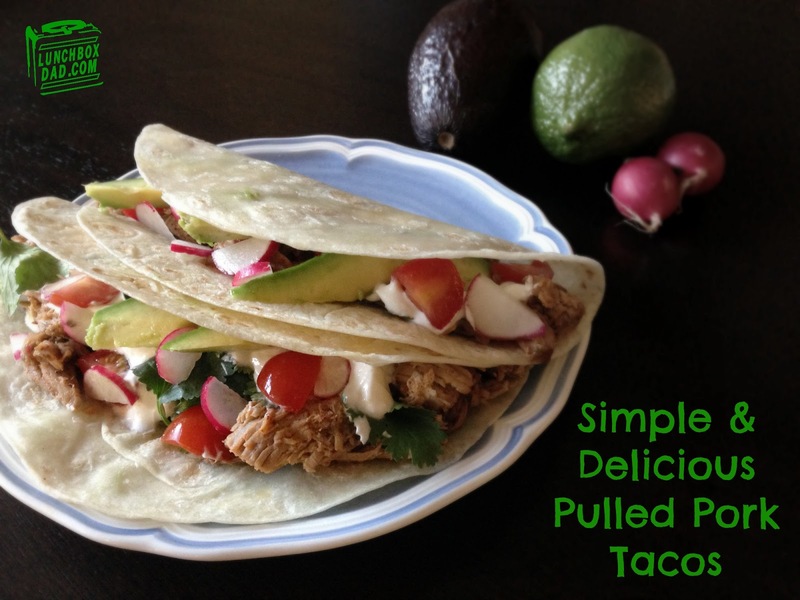 Pulled Pork Tacos Are Simple with Lucky Supermarket! Sometimes you just need a simple recipe that tastes great and appeals to the whole family. You have picky kids and want your family to eat healthy as well. These pulled pork tacos will definitely do the trick! The great thing about this meal is it is not only easy to prepare, but it is fun to eat. The adults and kids will have a blast picking and choosing the ingredients to construct their perfect taco. The ingredients are fresh and different and you just might get your kids to try something new like I did. My daughter ate radishes for the first time because of this recipe. This might be the perfect family meal for you this weekend and everything in the recipe is already in your cupboard or easy to find at Lucky Supermarket. In fact, the pork shoulder roast is on sale in a mix-and-match deal where you can buy one select meat and you get one free! Since Lucky Supermarket is located on the way home from work, it was convenient to stop by and pick up the meat. What wasn't easy was choosing between all the selections of meat. I almost bought turkey but decided to go for a ham and pork shoulder. 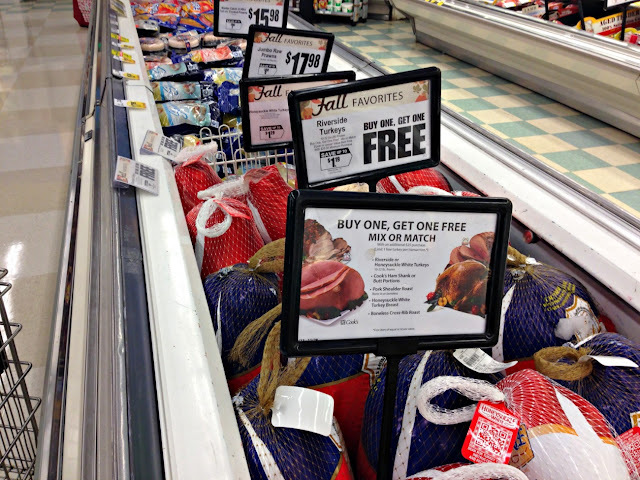 For this mix-or-match sale you can choose ham, pork shoulder, cross rib roasts, whole turkey, or turkey breasts. The pork shoulder is perfect for this dish. When I got the food home, I couldn't wait to cook up the meal but I had to wait until the next day when we would all eat dinner together. Family dinners are important in our house because it is a time to reconnect, have fun, and hear about each other's day. Good food just makes this easier. 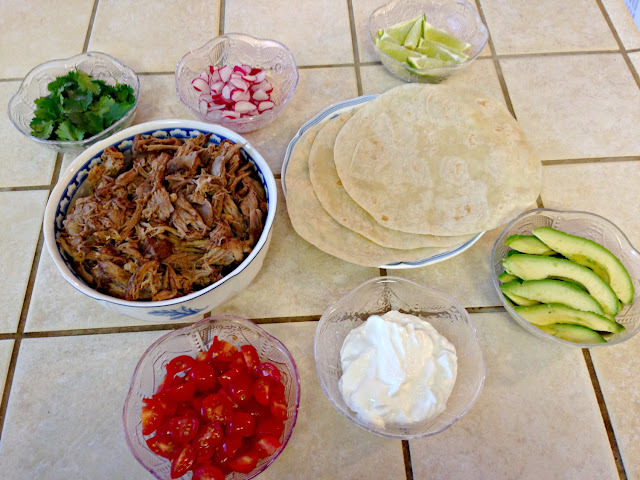 So I hope you can use this recipe to bring your family together and enjoy constructing and eating your tacos! These serve 4-6 people. 1. Preheat oven to 300 degrees. Mince the garlic cloves and put into a small mixing bowl. Mix together garlic, green chilis, and chili seasoning mix. 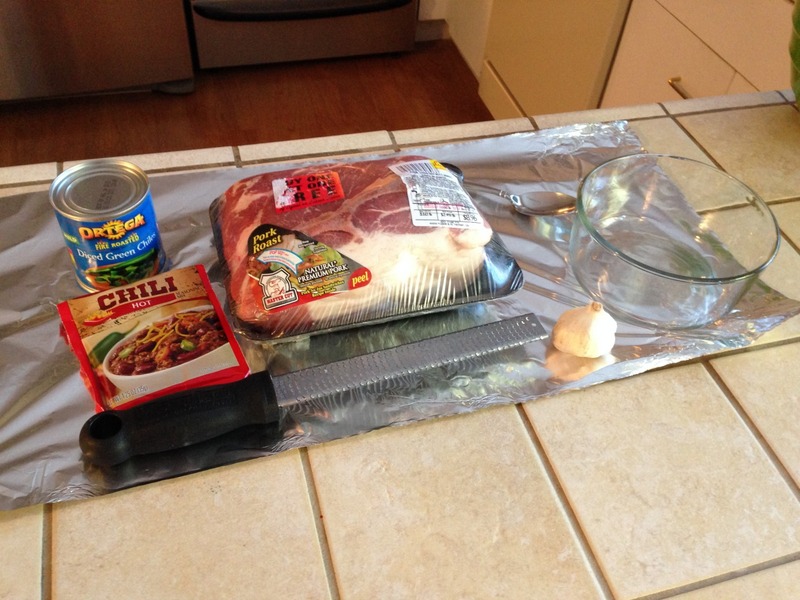 Place pork shoulder on large sheet of aluminum foil. Spread chili rub evenly on pork shoulder. Make sure to use all the rub and cover the entire shoulder. This might seem like it will be too spicy but this rub gives the pork a nice flavor. 2. Wrap the pork in the foil and place in metal baking dish. Put pork shoulder into preheated oven and cook for 3 to 3 1/2 hours. You should always check the internal temperature of meat with a meat thermometer. The pork should be so tender it almost falls off the bone. 3. While the pork is cooking, slice the radishes, cilantro, and lime. Place in covered containers and put in the refrigerator. 4. 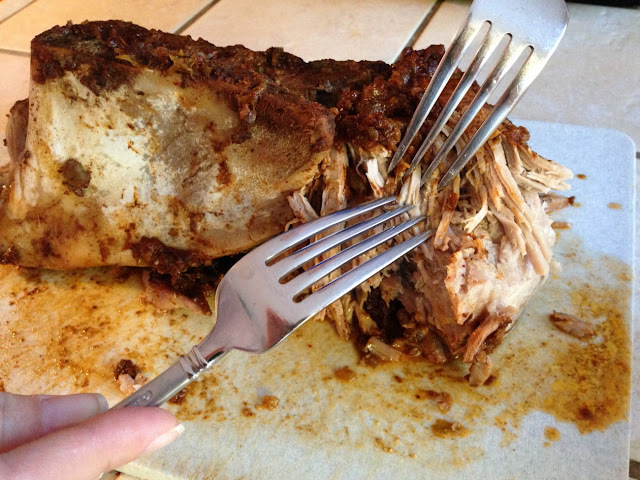 When pork is done, pull the shoulder apart using two forks. It might sound difficult but it is very easy. Stick the forks in the meat and pull apart in opposite directions. Place pork in medium size serving bowl. If you want a little more flavor, pour a few spoonfuls of the drippings from the pan back over the meat. 5. Slice avocados and tomatoes. Place them and the sour cream in serving dishes. Take out radishes, lime, and cilantro. If you want to add some spice serve a hot salsa as well. Heat up the tortillas. Remember to squeeze the lime juice on top of each taco and serve your family an amazing meal! I hope you have a great week leading up to Thanksgiving. 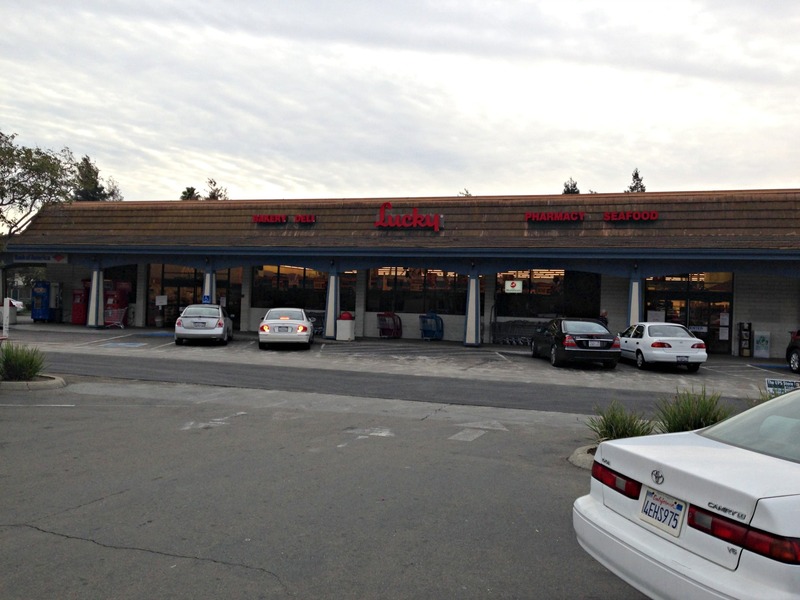 Maybe this Fresh Find from Lucky Supermarket can help you fix an easy meal while you are preparing for your Thanksgiving feast. Lucky Supermarket has some other creative recipes in their Fresh Finds section so check that out as well. Please share this recipe with all your friends and follow me on Facebook, Twitter, and Pinterest. Also, keep checking back because we have some exciting news coming up! This looks absolutely delicious. I need to make some of this soon!! Thanks Steph! It is such an easy recipe and my family loves it because they can construct the tacos exactly how they like them. Have fun with it! Looks delicious! I love new easy recipes! Well hopefully you will love this then Jen!